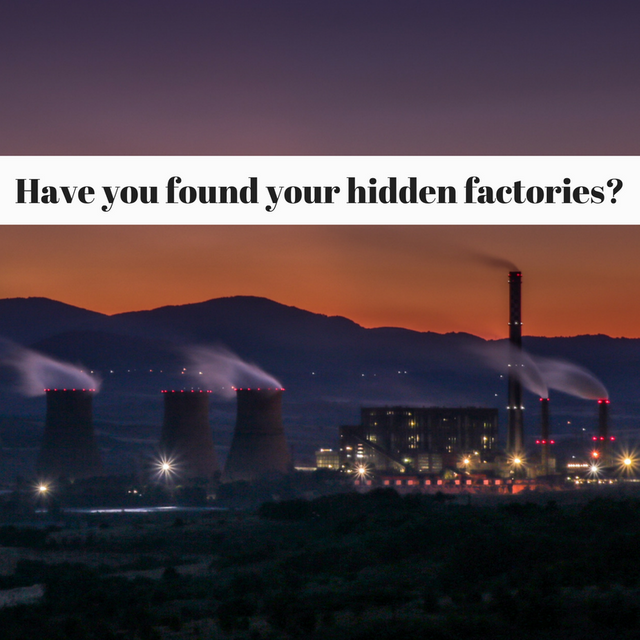 Healthcare colleagues: have you found your hidden factories? Remember, friends, many of the concepts of quality improvement that we are re-discovering in healthcare already have names. Items like "rework", "pokayoke" and "COPQ" are terms long-ago coined for concepts that we are re-discovering as we go from volume to value in healthcare. Let me share another: the concept of "the hidden factory". In healthcare, we make something: we make people better. Whether we measure that by return to activities of daily living, FIMS score, YPLLs, HVPI, or some other gauge, the fact is our systems are designed to do something...and we do it while making waste along the way. A healthcare system was looking at its inpatient stay process to investigate its Length of Stay (LOS). As part of the project, the discharge process was reviewed. It seemed like patients sat in the hospital much too long once they were discharged. What was going on? A hidden factory, that's what. It turned out that the discharge process looked great on paper. Providers would see the patient in the morning, validate that the patient was ready for discharge, paperwork was completed in the electronic medical record, and (instantly!) the order would be placed and the patient was discharged with outpatient followup. Great looking, straightforward process...except it wasn't the only thing that was going on. In fact, a culprit hidden factory was truly gumming up the works. When the team went to the place the work was done, the issues became much more obvious and the factory was made visible. Yes, the providers would come around in the morning and say the patient was ready. Then a significant delay occurred before the paperwork was complete and orders were entered. Then, the nurse needed to review the paperwork because there were always issues with the discharge instructions and followup phone numbers given to the patient...those were always wrong. The nurses knew there was an issue every time, and so they used some of their scarce time to make corrections in order to protect the patients. Also, the discharge paperwork and prescriptions could only be printed at one location in the hospital owing to availability of the computer equipment. Someone needed to walk to the special printer, pick up the paperwork, and walk it to the floor for discharge. This simple example of a hidden factory, a system within a system meant to correct errors and to do rework created by the first system, routinely cost each patient 0.5 hospital days. When the hidden factory was recognized and eliminated with a quality improvement project, the patients and hospital greatly improved an important endpoint. What hidden factories do you recognize in your daily routine? inside every factory is a hidden factory. The role of this hidden factory is to fix up all the mistakes. It is a factory that loses money within the factory that makes the products.